Hi everyone! 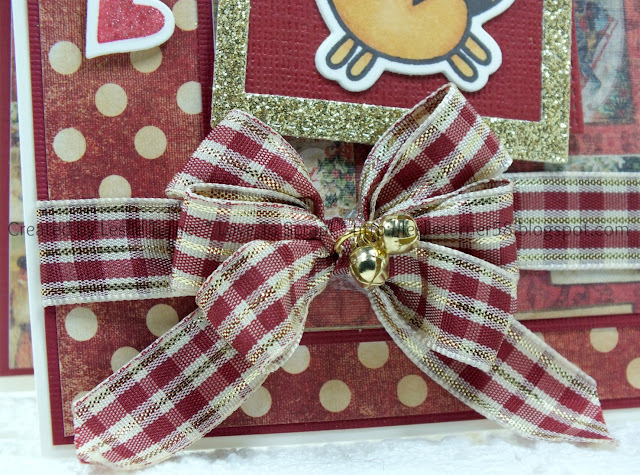 Leslie here, sharing a Really Reasonable Ribbon DT inspiration project with you today, one of the last Christmas cards I created for this season! I am proud to say that I was ahead of the game this year and had all my cards ready to mail on December 1st! Woot-woot! I used the absolutely gorgeous Plaid Ribbon Ivory/Rust/Gold on this card which I've added this to my list of all-time favorites! I created this gorgeous bow with my Bow-it-Allv2.0. Be sure to see Bonnie's awesome bow tutorials on YouTube. I hope you've enjoyed today's project! Be sure to check out the vast array of ribbon and crafty goodies and tools at Really Reasonable Ribbon! I can't say enough about the amazing selection of products, awesome prices, fast shipping and great customer service!